There are people in Hà Nội who live very close to a railway line. Over the years they have learned to always get off the tracks when a train approaches. People have even brought up their children and grandchildren very close to these tracks. It is such an unusual sight that tourists even come to see the area. By Paul Kennedy & Bảo Hoa report. Vũ Thị Khoa washes her dishes in a plastic basin outside her home using water from a makeshift hosepipe. As she carefully scrubs away the dirt she issues a frank and stern warning. Khoa has lived less than a yard away from the railway line for 27 years, so she knows how to stay safe, and to keep others out of trouble, too — she’s raised her children and grandchildren there. She’s used to the noise, used to the dirt and used to the risks, just like all the people who live their lives on the train line in Hà Nội. 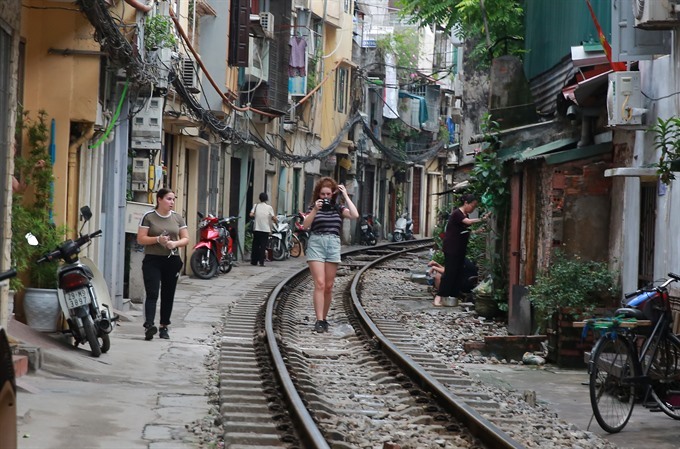 Several stretches of the North-South railway line passing through Hà Nội have become points of attraction for foreign tourists because of the houses people occupy just a few steps away from the tracks. Dating back to 1881, the 1,730km North-South railway line passes through 21 provinces and cities across Việt Nam. When Hà Nội Station opened in 1902, the train lines that entered it were built in barren areas. But as the city grew and became more populated, houses were constructed closer and closer to the tracks. It is estimated there are hundreds of households living this way in the city’s inner districts, including Ba Đình, Hoàn Kiếm and Đống Đa. Most of the residents used to be railway workers. Some moved to the capital city from other provinces to find jobs. Open up Dậu’s front door and there’s a small kitchen, bare walls, a room and an electric fan, constantly pointing in the direction of her husband, who lies on the bed. He suffered a stroke seven years ago and has rarely moved since. Using a method like Khoa’s, Đào Văn Chính scrubs away dirt from his clothes as he sits leaning over a plastic basin where he washes his garments. They may come out of the water clean this time, but it won’t be long before they need a new rinse. Though life here is hard for residents, to the tourists who regularly visit it is a magical place and a must-see during their stay in Hà Nội. The place is often a hive of activity packed with visitors desperately searching for a new profile picture. “It’s a completely different cultural experience to where we are from,” says Jamie Smith, from Scotland. Children play, pets run around and plastic chairs are placed in the centre of the railway while people just chat and go about their normal lives, many playing board games, others sipping tea. Businesses operate yards from the track, such as restaurants, beauty salons and cafes. One shop even sells clothes. Each day dozens of trains pass through these tracks, even more on weekends and evenings. Tourists know the train times and come prepared. Long before the engines come, they move towards the middle of the line, posing for the camera, looking for the coolest of shots. they are ready to record this once-in-a-lifetime experience. Though considered by tourists a unique cultural mark of Việt Nam, living close to the railway safety regulations. The 2006 Law on Railways stipulates that the space between the railway line and residential areas must be five to seven metres. That’s what Phương Thành Đại remembers. Having worked as a train driver for 27 years, it has become his daily routine to carefully negotiate the challenges faced by all train drivers picked for those particular routes. “When I first started as a train driver, there was ample distance between the train line and the residential areas,” says Đại. “It must have been a few metres but now they are too close to one another. Residents encroach illegally on the space to the rail line because they live so close. Citizens of Hà Nội are often seen crossing the railway line wherever they see fit. Small vendors, street hawkers gather near the line to sell stuff, only rising to their feet when hearing the train horn signal. Around 5,000 level crossings in the country, of which 4,302 are illegal, remain unguarded and are the main cause of railway accidents, according to the Việt Nam Railways Corporation. Figures from the corporation show that only 641 level crossings, which are built to cross railway tracks, are manned by its staff. The rest, including 4,302 illegally built level crossings, are only equipped with warning signals or alarms. They also show that 70 per cent of rail accidents reported in 2017 occurred at these crossings. A survey by the Việt Nam Railway Authority in 2012 showed Hà Nội as one of the localities with the most violations of railway safety, Kinh tế & Đô thị (Economic and Urban Affairs) newspaper reported. Today it is near impossible for the authorities to change the area. Short of knocking down all the houses, it would be extremely difficult to move those that live here to new accommodation. “They will then report to the higher-level authority so as to develop house clearance and relocation options,” he adds. With safety in mind, the committee wants to make sure the area is well patrolled and people who live and visit the area take extra care. Phạm Nguyễn Chiến, head of the railway safety and security department of Việt Nam Railways Corporation, says that although living so close to the railway line is against the law, enforcing it would be difficult. With few options available, the railway residents of Hà Nội must continue to live their lives on the line. While they admit it’s not easy, many of them are that used to living there, it has become normal. And while they all share the same common denominator as they struggle day to day, they have managed to form a community with a close-knit spirit far higher than many other neighbourhoods. Frank means honest and direct. When Hà Nội Station opened in 1902, the train lines that entered it were built in barren areas. But as the city grew and became more populated, houses were constructed closer and closer to the tracks. Populated means filled with people. A stroke is an injury that involves blood going to the brain. A rinse is a process in washing in which soap is washed off whatever is being washed. Exhaust is what comes out of an exhaust pipe. Backs firmly to the wall, lenses pointed in the direction the train as it approaches they are ready to record this once-in-a-lifetime experience. Lenses are curved pieces of glass that are an important part of a camera. “When I first started as a train driver, there was ample distance between the train line and the residential areas,” says Đại. Ample means so much that there is enough. A residential area is an area where people have their homes. “Residents encroach illegally on the space to the rail line because they live so close. To encroach means to slowly occupy. To do something illegally means to act against the law. Small vendors, street hawkers gather near the line to sell stuff, only rising to their feet when hearing the train horn signal. Vendors are people who sell thing. Figures from the corporation show that only 641 level crossings, which are built to cross railway tracks, are manned by its staff. If level crossings are manned, people are working there on them. A violation of safety is something someone may do that is against the safety rules. To review something means to examine it again. If an area is well patrolled, authorities go there on patrols. A patrol is a routine visit to a place to check that everything is okay. “The biggest difficulty is we cannot prohibit residents from entering their houses,” Trung says. “In order to ensure their safety every day we send civil guards to patrol the area and instruct residents and foreign tourists to comply with the railway and road traffic laws. To comply with railway and road traffic laws means to obey them. To impose penalties means to dish out punishments. To admit something means to confess that something is true. A common denominator, in this case, is something everybody in a group has in common. Vũ Thị Khoa has lived less than a yard away from the railway line for the last seventy-two years. Hà Nội Station opened one hundred and sixteen years ago. Tourist Jamie Smith is from Scotland. Phương Thành Đại has worked as a train driver for twenty-seven years. Nguyễn Thị Dậu once suffered a stroke. ANSWERS: 1. False; 2. True; 3. True; 4. True; 5. False.